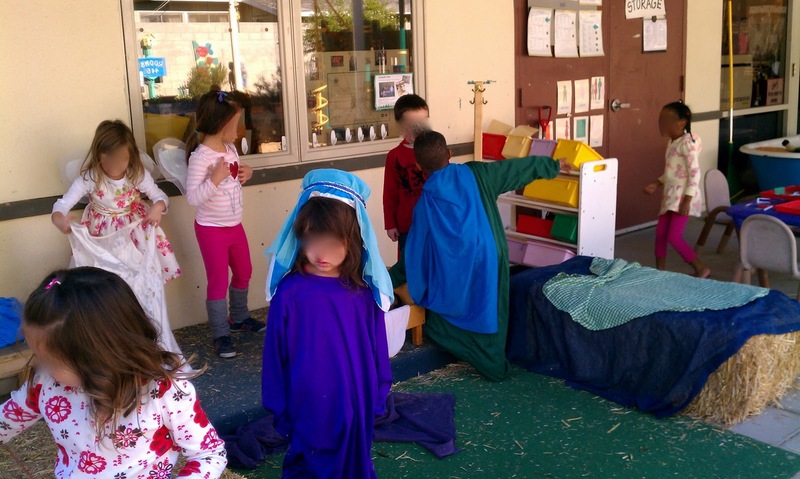 In the spirit of the season, we joyfully hauled out all of the nativity-style clothes we could muster for the children to explore in our new Nativity dramatic play area. 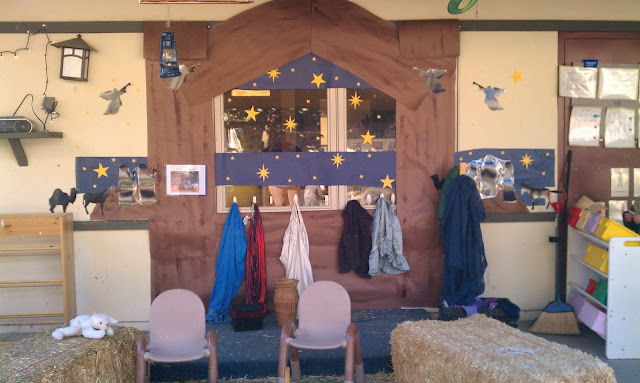 We supplied wings for the angels, sheer fabric, gowns for Mary and cloaks for Joseph, headbands for the shepherds, fancy hats and gifts for the wise men, blankets, stuffed animals, and of course, Jesus and the manger (a doll and cradle). We had two bales of hay to define the area. Sounds great, but in fact, it looked...well....pathetic. Truly, it looked like two bales of hay and a crate of clothes. So, what to do for our sad looking corner? Bring on the butcher paper and erect a stable!!! For the final touch, we just added a HUGE glittery star that hangs from the ceiling! 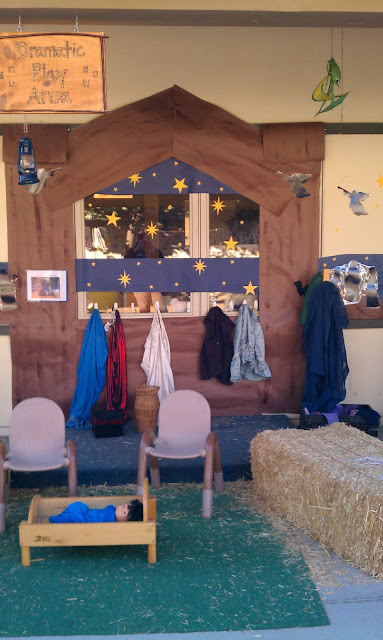 Cue the Christmas music, and HARK, we have an inviting dramatic play that is fit for the season! I love this! How fun, I wanna come play. Hmm... I think next year you will have to try harder. I would suggest bringing in a couple of live oxen, a pair of sheep and importing a camel. LOL! Thanks, everyone! Juliet, I suppose I shouldn't forget the donkey! We do have a bunny that gets to hop around the yard during nap time...does that count? ;-) She loves to hop over to the dramatic play area and munch on the hay. She was even trying to eat the paper when I was posting it to the wall! Lol! Wow! I just find your blog through Let the children play, and i like it. I wish you a lot of success and I am looking forward to visiting often. This looks so fun and inviting! Thanks for linking up to the Outdoor Play Party! There is now a grab button for you to post - you can get it from my page. Hope to see you again for our last link party of the year, on now. 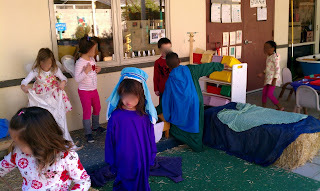 Those all of the nativity style clothes is very perfect to the outdoor play party. Everything is excellent in your home. I attract by that. That is great creativity.